Picking a cabinet door style and material is a major decision! The door style and material create a foundation for a room’s interior design and can represent an investment of tens of thousands of dollars. 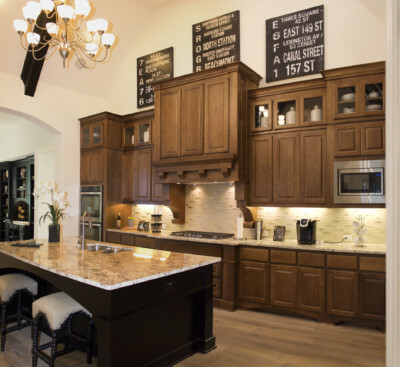 Cabinets typically remain in a home for generations and are a major factor in home value and how quickly a home sells. Most buyers spend hours researching options and deciding on a design that strikes the perfect balance between personal taste and something universally appealing. We’ve worked in the cabinet industry for several decades and we’ve seen trends come and go, national and regional preferences, which cabinet door designs are timeless, and which materials stand up well to daily use. We used this experience and knowledge to create our Cabinet Door Buyers Guide detailing the top considerations when picking a cabinet door style and material. What material do you prefer visually and what characteristics do you need in your material? 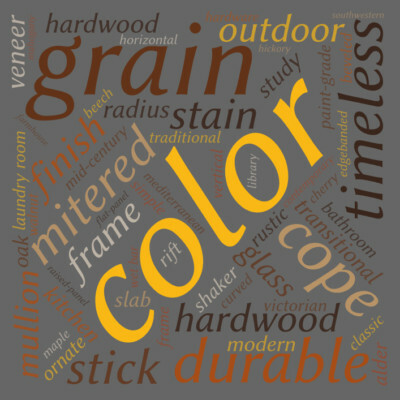 Wood characteristics to consider include wood hardness (see TaylorCraft’s Wood Hardness Rating Scale), grain pattern, stain absorption qualities, color (when new and over time as some wood color, cherry and walnut particularly, changes when aged) and stability (tendency to expand/contract, warp or split). Color, Grain Pattern and Ability to Accept Finish: Some wood species have heavy, distinctive grain patterns and are very porous and can accept stain unevenly depending on use of sealers. Others are tight-grained, smooth, dense with light grain rays that are not prominent. 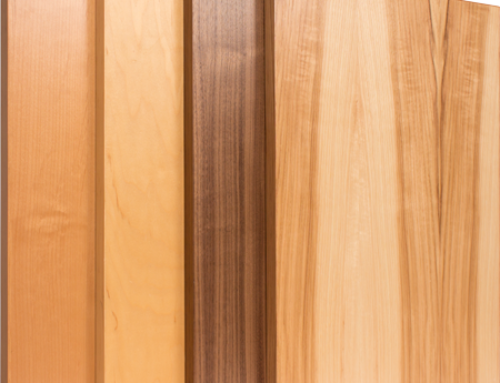 Some wood species such as hickory vary widely in color from light blond to dark brown within each board. 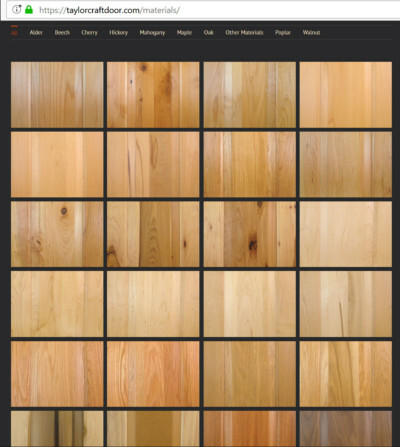 Each type of wood accepts stain differently so be sure to view stain samples on the wood species you choose for a true representation of the finished product. Where are your cabinets going? Outdoor Cabinets: If you’re installing outdoor cabinets, weather resistant material such as teak, bamboo or stainless steel, and a door profile that is easy to clean, without a lot of nooks, crannies and ornamentation that collects dirt will be major considerations. If cabinets are going into a temperature and humidity controlled environment the material choices are much broader. 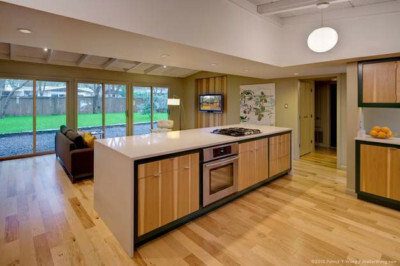 Indoor Cabinets: Even inside a home, consideration should be given to durability of material in high use areas. Relatively soft woods like Western Red Cedar and Eastern White Pine should not be installed in high traffic areas because they are easily dented and scratched, unless you want a distressed appearance. 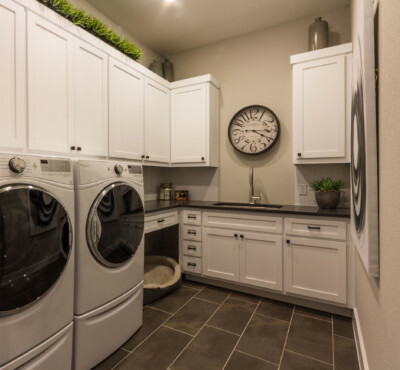 Humidity and Paint Grade Material Considerations: If you want painted cabinets in your bathroom, laundry room or other room with significant humidity changes, consideration should be given to material stability. Wood expands and contracts with changes in temperature and humidity and some wood is affected more than others. When expansion and contraction occurs, cracks can appear in the paint where the panel meets the frame and where the frame parts are joined together. Many of our customers prefer an MDF panel (because MDF is a composite material and doesn’t easily expand and contract) rather than a wood panel, and relatively stable, paint-grade, hard maple frame for their painted doors rather than soft paint-grade materials, especially in humid areas. What is the overall look you’re going for and what is the style of the home? While an eclectic look, mixing materials and designs, can be appealing, some styles tend to mix better than others. If your overall look is modern, an ornate, applied moulding cabinet door style may look out of place. TaylorCraft Cabinet Door Company has a complete cabinet door style guide with descriptions and examples of cabinet doors and cabinet photos for each style including modern, traditional, transitional, shaker, Mediterranean, Victorian, southwestern, rustic, tropical and more. Define your overall interior style and use that as the basis for your cabinet selection for a cohesive look. Trends in interior design are similar to clothing. There appears to by a cycle of colors and styles coming in and out of vogue. We wrote an entire article on which materials and styles are trendy and which cabinet styles and colors are believed to be timeless and another article on which cabinet door styles and materials are expected never to come back into popularity. Read the articles for more information but for a quick summary, white paint, simple design (eg: shaker style) and solid, natural wood cabinets and cabinet doors will always have a place at the table. 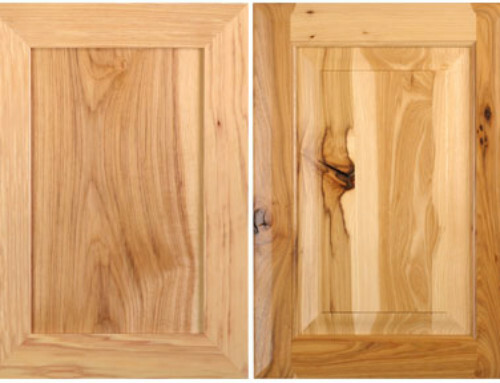 Which Cabinet Door Construction Do You Prefer? Cabinet construction options inlcude frameless, faceframe and flush inset. Faceframe and inset are more traditional looks and frameless is more contemporary. For complete descriptions and photos of cabinet construction options visit our cabinet construction options page. Cabinet door design options include cabinet door thickness (TaylorCraft Cabinet Door Company offers 3/4″ and 1″ thick cabinet doors) and stile and rail width which can vary from 1-5/8″ to more than 4″ wide. TaylorCraft’s standard style and rail options are 2-3/8″ or 3-1/8″ wide with a 1-5/8″ rail height option for small 5-piece drawer fronts. Cabinet door detail is determined by the outside edge, inside edge and panel profile. Some companies allow you to pick and choose between options to create your own design and others have pre-defined styles. 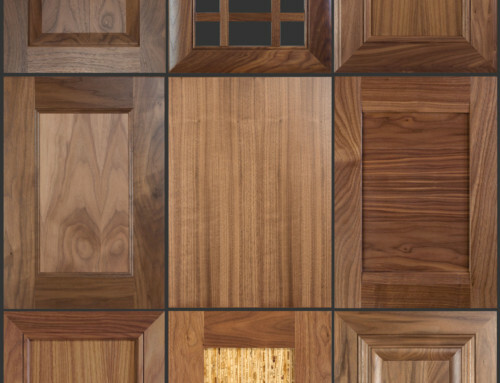 See TaylorCraft Cabinet Door Company’s cabinet door profile options page for more options. Cabinet door construction options include the way the door frame (or lack thereof) is constructed mitered, cope and stick, combination frame and modern slab veneer doors are detailed below. Mitered cabinet doors are built with stiles and rails meeting at a 45 degree angle at the corners. Mitered door construction allows the frame detail to flow all the way around the door so a more detailed frame can be created. Because of the precision required to make the frame detail match up at all 4 corners, mitered cabinet doors can be more expensive than cope and stick. Mitered cabinet doors can be created with a blind mortise and tenon joint where you can’t see the joinery at the corner. In some construction methods you see the joinery at the corners. TaylorCraft uses CNC blind mortise and tenon joints which use the existing material for the tenon. This is beneficial during expansion and contraction because the tenon is the same piece of material as the frame. Some tenons are made of different material than the frame which becomes a weaker joint over time due to contraction and expansion. On Cope and Stick doors the stiles and rails meet at the corners at a 90 degree angle, and the frame detail is limited to the outside edge and inside edge of the frame. Modern slab doors are made up of veneered hardwood over an MDF core for stability with outside edges edgebanded with 1.5mm to 3mm thick veneer tape to cover the raw MDF edge. Solid wood slab doors are less common and are made up of solid pieces of lumber glued side by side horizontally or vertically. Because of the lack of a supporting frame, solid wood slab doors are prone to warping and twisting so manufacturers willing to make them add battens (typically two or more pieces of lumber screwed in perpendicular to the wood on the face of the door) on the back of the doors for stability. Applied Molding Cabinet Doors can be made either cope and stick or mitered construction with a decorative molding applied to the inside edge or the face of the door for extra detail and a more 3-dimensional end product. Mullion (Divided Lite) Cabinet Doors are made with horizontal and vertical mullions in place of a solid panel to allow visibility to cabinet contents and provide decorative detail. Clear glass inserts are typically installed behind the mullions to keep dust out of cabinets. Sometimes decorative seeded, swirled, frosted or colored glass is used to give a period look, decorative touch or to obscure cabinet contents. Cabinet Doors cut for Glass Panels are created using a cabinet door frame only with the back of the frame rabbeted with a ledge to accept a glass panel, allowing complete visibility to items displayed in the cabinet. Many people add interior lighting to their glass-door cabinets to display vases and other decorative collections.